1982 In May of 1982, a new testing procedure was establish ed for the U.S. Military test. This procedure used revised reliability criteria approaching more realistic levels, but still did not allow any pistol to qualify and no tests were conducted. Product development in Gardone Val Trompia continued during this period, yielding yet another new variation of the 92SB: the 92SB Compact "Type M". The new compact type M pistol, also chambered for 9mm Parabellum, featured an 8‑round single line magazine with reduced grip width. A corresponding 7.65 mm. Parabellum version designated the Model 99, was developed for the commercial market. 1983 As a result of pressure exerted by U.S. Congress, new tests were requested in the United States, and the U.S. Army was again chosen by JSSAP to carry out these tests designated: XM9 Service Pistol Trials (SPT). In Italy, work continued on yet another new version of the Model 92S13. Designated the Model 92F (initially referred to as the 92SB‑F), it was given a combat trigger guard to improve the grip during two‑handed shooting, the barrel was internally chromed, and a matte black “Bruniton”® finish is added. In fact, this model was identical to the previous Model 92SB with certain modifications to make it even more competitive in the U.S. Military tests. 1984 The new XM9 tests started at the beginning of the year and included seven candidates: Smith & Wesson 459A, Beretta 92SB‑F, SIG Sauer P‑226, Heckler & Koch P7, Walther P88, Steyr GB and F, and the Browning ADA. The tests were conducted in different locations that specialized in various types of tests (adverse conditions, ballistics, endurance, targeting and accuracy, and reliability testing). The testing took until September to complete. Announcement of the winner of the competition was delayed due to legal opposition of two of the competing manufacturers: Smith & Wesson and Heckler & Koch, whose pistols were disqualified in the initial phase of the testing. 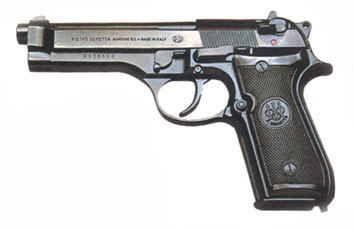 1985 On January 14, the U.S. Army officially announced that the Beretta 92SB‑F was the clear winner of the competition. The Beretta pistol, designated by the U.S. Military as the M9, was one of only two weapons that successfully completed the test. The other finalist was the Swiss‑German SIG Sauer P226. The contract for 315,930 pistols valued at approximately $ 75 million was awarded to Beretta U.S.A. Corp., Pietro Beretta's U.S. affiliate, on April 10, 1985. Smith & Wesson of Springfield, Massachusetts, initiated legal action aimed at interrupting the acquisition of the M9 pistol by the U.S. Military. In accordance with the terms of the contract, while Beretta U.S.A. Corp. proceeded to tool up for local production of M9 pistols, P. Beretta Gardone V.T. began to manufacture the M9 pistol. 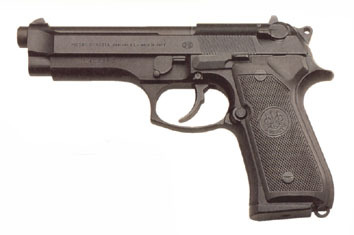 In the course of the year, production of the 92F began for the commercial and Military markets, as was the 9mm X21 IMI, designated Model 98F, which was destined for the Italian market only. The French Minister of Defence, André Giraud, authorized a competition on behalf of the National Gendarmerie, which led to the purchase of 110,000 9mm Parabellum pistols as replacements for the MAC 50 pistol. These pistols would be produced in France by a French company. Beretta is represented in France by a French MAS (Manufacture d'Armes de Saint Etienne). 1986 While the success of the 92F in the international market continued, in the United States Smith & Wesson made tireless attempts to block the M9 contract. In the meantime, numerous American law enforcement agencies decided to replace their revolvers with new high‑capacity, semi‑autocratic pistols and opted for the Beretta 92E In Gardone V.T., production of the M9 for the U.S. Armed Forces continued. In France' the competition for the National Gendarmerie continued with the Beretta 92E SIG Sauer P226, and Walther P88. 1987 WIn the United States, Smith & Wesson's legal and political action aimed at blocking the M9 contract continued. Beretta Gardone proceeded with the gradual transfer of M9 production to Beretta U.S.A. in Accokeek, Maryland. On July 7, 1987, the French Minister of Defence announced the selection of the Beretta 92F for the National Gendarmerie. MAS was assigned the task of producing 110,000 Beretta 92F pistols under license from Beretta S.p.A., Gardone V.T. Thus, two years after the American contract, the technical superiority of the Italian pistol over the same participants already defeated in the U.S. testing was confirmed. The model adopted by National Gendarmerie was the 92F with the safety modified in such a way as to simply function as a hammer‑drop (decoking lever, returning, after being activated, to the ready ‑to‑fire position. This weapon was designated the PAMAS GI.